Pours a beautiful dark gold color, with a 2-finger off-white head. Smells pumpkin-y, bready, and earthy, There are spices and yeast here, and also a little grass in the background. Taste is pumpkin against a lightly sweet, malt backbone. Spices are definitely present – nutmeg… and a perfect balancing bitterness, with a touch of alcohol in the finish. Medium body, moderate carbonation. Not bad, but I wish it were a little more creamy than it is. Some pumpkin beers are so heavily spiced and so poorly attenuated that they should really be marketed as pumpkin piebeers. Thankfully, Punkin isn’t one of them. Instead, you could almost think of it as more of a pumpkin bread beer – sure, it’s got spices, and some sweetness, but they are somehow balanced by the yeast and bread character, and when you toss in a healthy dose of pumpkin and the near-perfect bitterness, you’ve got what is a winner. 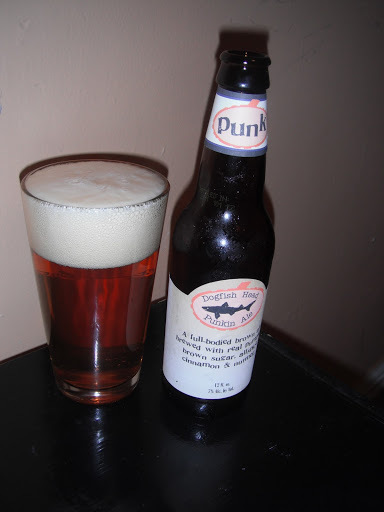 But perhaps my favoritething about Punkin is that, when I serve it to a friend who isn’t acquainted with the style, they’re likely to think it tastes like beer. A full-bodied brown ale with smooth hints of pumpkin and brown sugar. We brew our Punkin Ale with pumpkin meat, organic brown sugar and spices. This is the perfect beer to warm-up with, as the season cools.